I￼nternational soccer leagues (such as UEFA's Champions League) are great for sports road trippers who want to see their clubs play in other countries, but they are terrible for the players, who are forced to travel midweek before returning home for a weekend tilt with little time to rest. Nowhere is this more painful than in the Europa League, UEFA's second-tier tournament that holds its games on Thursday. Teams in England often head to Eastern Europe on Wednesday, play a late game on Thursday, and then return early Friday for a domestic contest on the weekend. 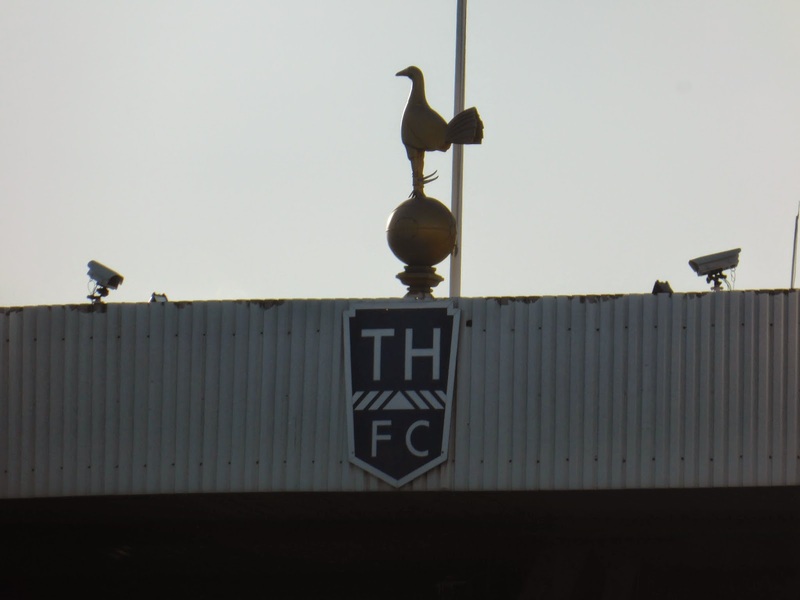 Tottenham Hotspur are one of the clubs playing in the Europa League this year and they had a game in Greece on Thursday, forcing their Saturday home match against Stoke City to be moved to Sunday afternoon. 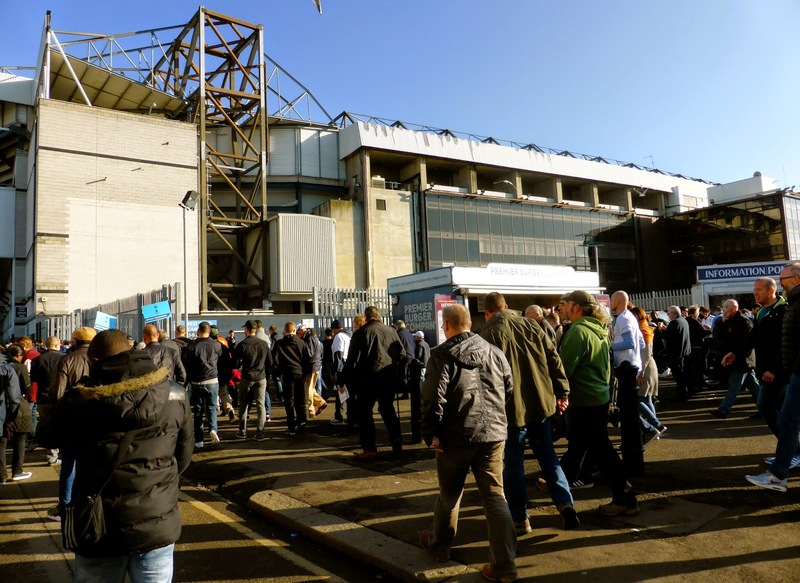 This worked out perfectly for me as I was able to visit White Hart Lane for the match before heading to Wembley for the NFL game between the Cowboys and Jaguars, but the players were not so enthusiastic as it turned out. I was staying in West London, which meant a nearly 90-minute trek to White Hart Lane (above) via the tube and the overground. I arrived at the stadium about 15 minutes before kickoff, but had no time to tour as lineups at the gate were absurdly long and slow. Don't bother trying to enter through any gate other than the one printed on your ticket, like most English soccer venues, you are restricted in what you can see and where you can sit. Once inside, you are advised to find your seat quickly; there really isn't much to see here anyway, a few concessions stands but not much else. 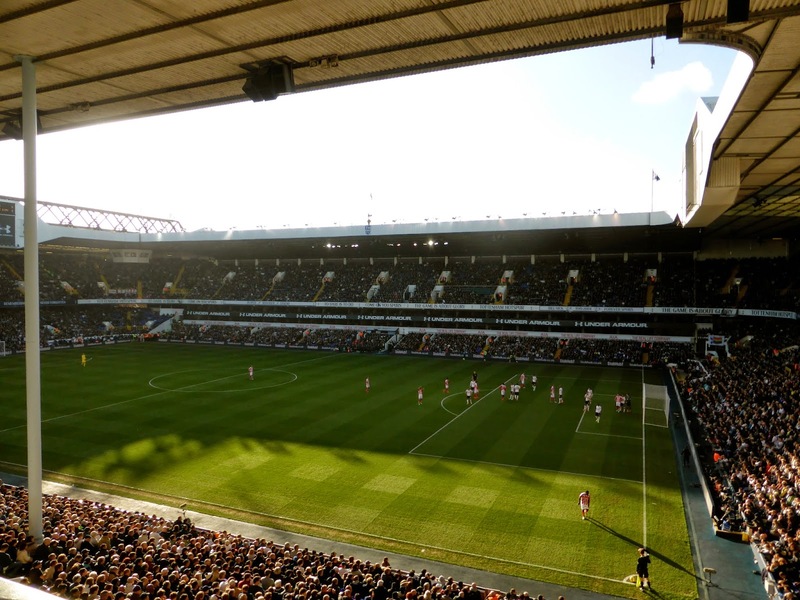 After my experience at Loftus Road the night before, I was surprised at the size of White Hart Lane. My friend Chris, newly arrived in London, joined me and we had seats in the second row of the upper deck facing the north goal (below). Tottenham had struggled all season after Europa League games and you could immediately see the difference between a tired Spurs side and the rested Stoke players. Just six minutes in, Bojan Krkić grabbed the ball at midfield and raced untouched to the top of the penalty area as the Spurs players backed off. 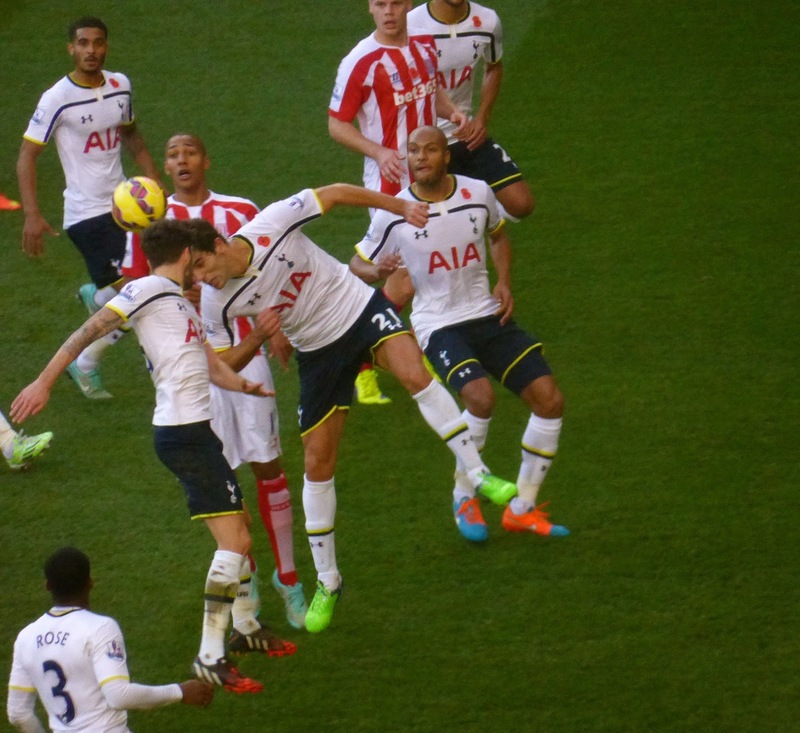 Seeing no need to pass, Bojan rifled a shot past Hugo Lloris into the bottom corner to give Stoke the early lead. The home fans were very unhappy and started booing, tired of their team's poor home performance, but all that served to do was frighten the players even further. It seemed like none of them wanted to touch the ball; their tentative play was almost embarrassing to watch. 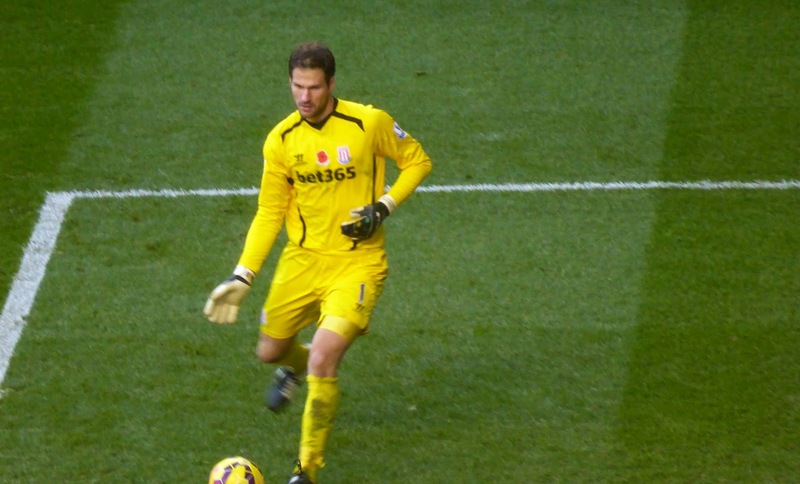 Meanwhile, Stoke began to kill time whenever possible, leading to a yellow card for keeper Asmir Begović (below). The time-killing tactic really wasn't necessary as Stoke added another in the 35th minute when Ryan Shawcross headed to Mame Biram Diouf down the right side. Diouf found an unmarked Jonathan Walters in the box and Walters made no mistake volleying home a perfect cross essentially ending things. Tottenham did score midway through the second half when Nacer Chadli drilled a shot into the top of the net from a sharp angle, but the cheers from the home fans were relatively muted; they knew it was merely window dressing. Tottenham brought Emmanuel Abedayor onto the pitch, but he was largely ineffective, with his late header falling wide as Spurs fell 2-1. This match was a relative downer after the thriller between Man City and QPR; I found that the Spurs lack of energy fed back to the fans, even those who are not followers of the club such as myself. All three goals were scored in the net we were facing, a small consolation for what was a tepid affair. I have now seen 4 EPL games and yet to witness a home victory. 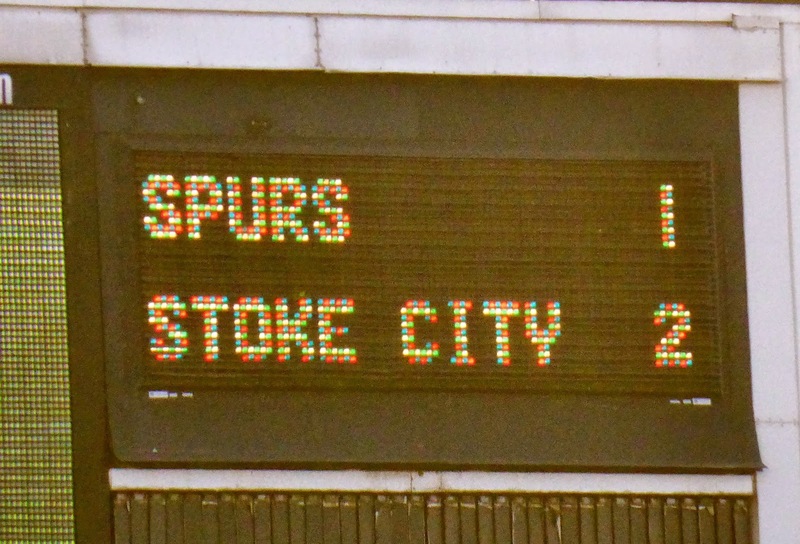 This was the second time I have seen Stoke on the road, they beat Fulham 1-0 back in 2010, my last time in England.